On topic, I feel as though Ho-oh EX BKP* isn’t a very good card in general, and that surely vikavolt can find better partners. But Ho Oh EX is from Breakpoint isn’t he? It’s the one with the triple type energy cost. And it has the ability to heal 50 damage once per turn if it has basic fire energy. And no it is not a good card at all. My deck would be crushed by competitive decks but its fun to play. I was lucky enough to pull a full art of Ho Oh EX when i bought the trainer box. Its the most beautiful FA in the set in my opinion. I was told it was unplayable but that is definitely not true. It’s difficult to use but it feels good when I win with it. In that article he basically says the card is slow and bad, but then he rates it 4/5. He also said Florges’ 70 for 3 energy attack is good, which is false. Apparently slow and bad is worth a 4/5, but who am I to judge? 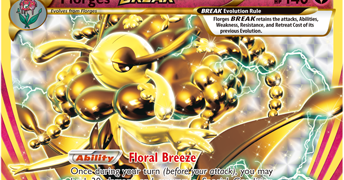 Florges Break is a bad card and will never play in this meta unless we get a very bulky very powerful basic or stage 1 Fairy type attacker. EDIT: read the article, not only did he mess up what it did in the article after putting a picture of it above, the whole article was pure theorymon, but like, not even good theorymon. Ya florges is bad in competitive and design wise for the card. The only reason I posted the article was an answer for pocketenix’s question. I use to view each card on primetimes blog but I stopped because the reviews aren’t really that interesting. Everything explained is pretty basic in my opinion. And his ratings are weird. I respect him for doing it though. Back on topic now. Vikavolt GX is a good idea to go for an even split line. The GX attack is awesome with Decidueyes ability. No, two stage 2 lines is not a good idea. You will play 3 vikavolts and 2 vikavolt GX’s, and the point of the deck will be to get a wide lens on the GX and energies using 1 or hopefully 2 vikavolts and then kill all their shaymins. By that time you’ll either have one or can finish it off using normal vikavolt. And if they don’t bench Shaymin? Then they set up about as slow as you and it is a close match with you putting tons of energy on with vikavolt and vikavolt GX and knock stuff out with either vikavolt plus the band thing that comes out in sm2 or using vikavolt GX’s attack that does 180.